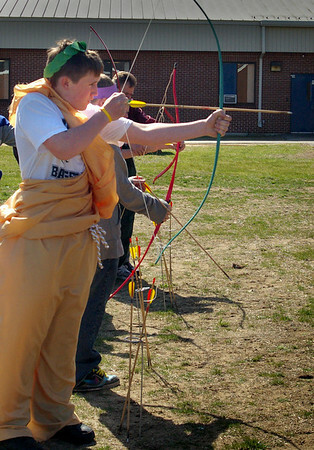 Seabrook: Dressed in a yellow toga, Seabrook Middle School seventh-grader Cameron Hauze takes aim with bow and arrow during an archery match. They were celebrating Greek Day and having their own version of the Olympics. Photo by Angeljean Chiaramida/ Newburyport Daily News Thursday, April 23, 2009.